I did this walk on Sunday 20th February 2011, following on from stage 10. Stage 11 is a comparatively new addition to the Green Chain Walk, having only been opened in September 2010 and runs from Crystal Palace Park to Nunhead Cemetery with an arm heading off to Dulwich Park which is where I headed next. From Crystal Palace Station the route, photo 1, heads briefly up to the left before heading to the right through the Canada Gates, photo 2, and along a driveway running through the top end of Crystal Palace Park, the path running parallel with the Italian Terraces. 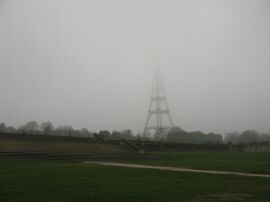 The weather was still grey and gloomy and only the bottom portion of the transmitter tower, photo 3, could be seen through the cloud. Passing above the top of the bowl in Crystal Palace Park, photo 4, the route does a quick left, then right before heading up a short steep slope out of the park to join a road, Westwood Hill. As well as having two distinct arms stage 11 also has a couple of points where there are alternative routes and this spot marked the first of these with options to head either to the right or left along the road. After sheltering under a tree for a few minutes to allow a heavier band of rain to pass I set off to my right. Here the route heads to the left crossing over the road and continuing along Westwood Hill before turning to the left down Ormanton Road, photo 5. 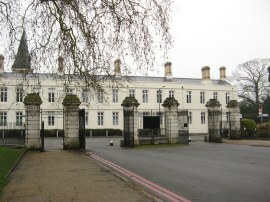 At the end of the road the route crosses over Longden Avenue and heads into Sydenham Wells Park, photo 6. 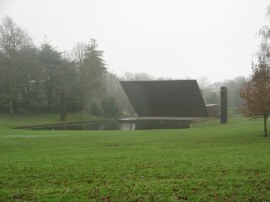 The route then makes its way across the park, heading past an attractive pond before heading uphill to the other side of the park. Leaving the park along a rather narrow and steep section of tarmac path the route heads to the left up Wells Park Road. The route heads quite steeply uphill along the road to reach the point where it links up with main route of the Green Chain Walk; The route that I had taken first being the alternative step free route. I then turned round to go back to Crystal Palace Park and walk the main route although I actually walked the main route in reverse to get there as it was a shorter distance than the alternative route I had just walked. Back at Crystal Palace Park I then set off to walk the main route between the park and Wells Park Road in the correct direction. 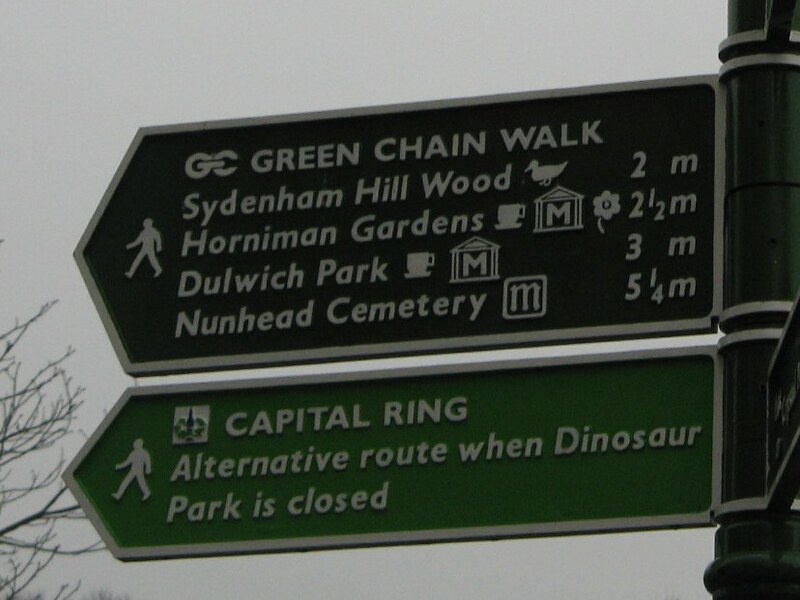 I had been surprised to see that on leaving Crystal Palace Park only the alternative route appeared to be signposted from the exit to the park although a little further on the main route is clearly marked. Having thought about this I think this may be because both routes may actually leave the park to the right in order to use the pedestrian crossings over Westwood Hill Road before the route then splits up once over the busy road which would make sense, although I didn't notice a sign pointing in both directions once I was across the road. 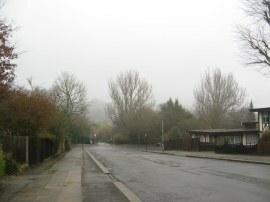 Anyway I followed the rather busy road before heading down Sydenham Hill on the right. 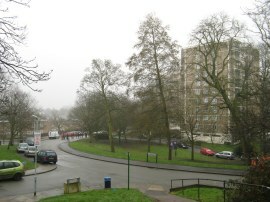 Leaving the road, the route heads down a steep tarmac path that heads downhill through a small band of the trees to reach the tower blocks of the Hillcrest Estate. Joining a road through the estate the Green Chain Walk continues ahead for just a few yards before turning to the left along Vigilant Close where I briefly linked up with a very large group of rambler which can just be made out crossing the road at the back of photo 7. 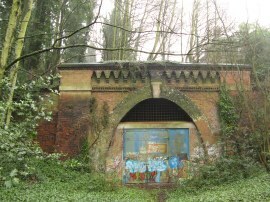 At the end of the road, past a line of lock up garages, the route continues ahead along a footpath that heads uphill, climbing up besides the boarded up entrance to the old Crescent Wood rail tunnel, photo 8, to rejoin Wells Park Road where the alternative and main routes link back up. 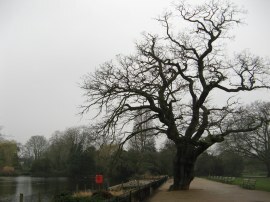 Having walked both routes I thought that the alternative route through Sydenham Wells Park had actually been a far more attractive option than the main route was. Reaching the end of Wells Park Road the route continues ahead across Sydenham Hill and down Crescent Wood Road. 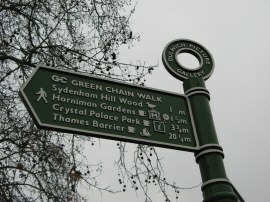 This road is followed as it bends round to the right before the Green Chain Walk joins a footpath on the left that heads down a few steps through a big metal kissing gate that leads into Sydenham Hill Wood. The route then heads downhill along what was a rather muddy set of steps before turning to the left along the course of an old railway line at the other end of the rail tunnel, photo 9, that I had passed earlier. 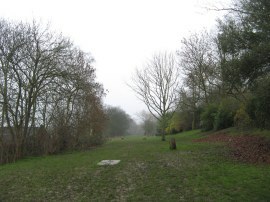 The route follows the old track bed of the line that once ran between Nunhead and Crystal Palace, photo 10, before joining a path that runs parallel to the track bed on the left hand side. 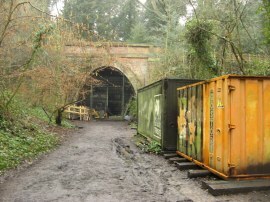 This leads up to a bridge, photo 11, across the former railway lines where the Green Chain Walk stage 11 splits into two, photo 12. The right hand path heading off to Nunhead and the other arm continuing ahead towards Dulwich and it was the Dulwich arm that I followed first. 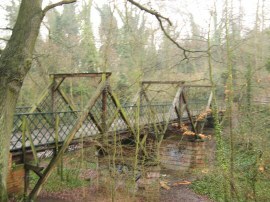 From the footbridge the Dulwich Arm of the path heads along a broad path that runs downhill through a thin patch of woodland, this stretch of path is known as Cox's Walk, photo 13. Reaching the end of this path, having past the tall spire of a church, the route turns to the left along the A205, Dulwich Common road. The Sunday afternoon traffic on the road was almost at a complete standstill as I made my way down past the Lordship Estate before heading through the Roseberry Gate into the grounds of Dulwich Park, photo 14, which was surprisingly busy with people out walking and cycling. 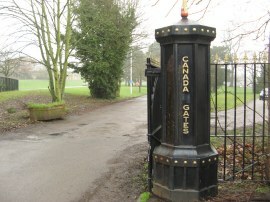 Here the route heads to the left alongside a broad driveway running through the park. After a few hundred yards the route leaves the driveway and heads to the right to cross the top of a pond before heading down the left hand side of the pond, photo 15, to eventually rejoin the driveway the route had followed upon entering the park. Reaching the College Gate opposite the Dulwich Picture Gallery, photo 16, I reached the end of this arm of stage 11 of the Green Chain Walk. 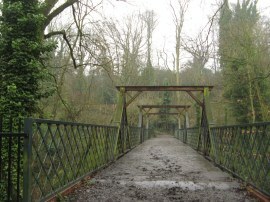 I then turned around and retraced my steps back to the Cox's Walk footbridge, photo 18, over the old railway lines in Sydenham Hill Wood to start making my way down the Nunhead arm of the stage. Once over the old railway lines the route heads down a short set of rather muddy steps before taking a footpath on the right that head downhill over very muddy ground, running parallel to the old railway lines. This was by far the muddiest stretch of path I had been on all day although fortunately it was quite short and I was soon on a tarmac footpath running through a housing estate. Reaching the end of the housing estate the route crosses over the South Circular Road into Horniman Gardens. 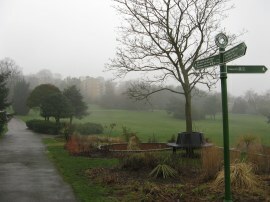 Here the path curves uphill round to the right, passing close to the bandstand. 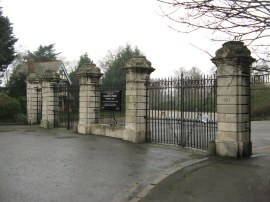 The park is also home to the Horniman Museum although I did not have time to visit this. 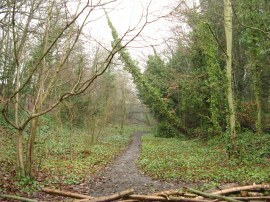 Leaving the gardens, a small stretch of hedge lined footpath leads to a road, Westwood Park where the route heads downhill to the left. The route is followed for quite a long way along this road as it bends round to the right before the route heads down to the left down Langton Rise. Reaching a road junction the route crosses over Wood Vale and then heads through a tall metal gate on the corner to join a path running through Camberwell Old Cemetery, photo 19, which is also marked on the map as Camberwell Old Cemetery. 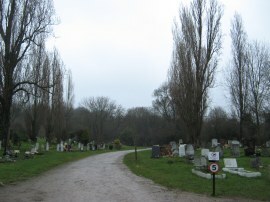 The Green Chain Walk winds its way through the graves and leaving the cemetery the route heads to the right up Forest Hill. A short distance up Forest Hill the route once again splits into two, one path continuing straight ahead up the road and an alternative route that avoids some steps heading left into Brenchley Park. This was signposted as being ¾ mile to the point where the two routes rejoin and thus, as it was getting late, I decided to miss walking the alternative route for now and just stick to the main route which heads steeply up along the rather busy Forest Hill road before turning to the left down Honor Oak Park. From Honor Oak Park the route heads up a long flight of steps that climbs up One Tree Hill, photo 20. 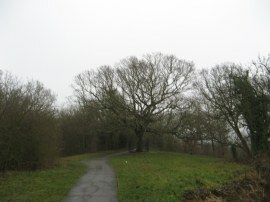 At the top of the hill the path heads to the right passing a commemorative oak tree that had been planted in 1905, photo 21. On a clearer day there would have probably been good views through the surrounding trees across London however in the grey mist there was nothing to be seen. 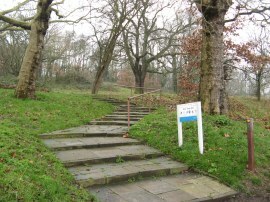 Bending to the left, the route heads down another flight of steps to join a path that descends very steeply through the trees. 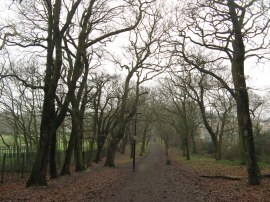 This path is followed down the road, Brenchley Gardens where the route links up with the alternative route of the walk from Forest Hill, the path then heading to the right along the road. However having made good time on this stretch via One Tree Hill I decided I would go and walk the alternative route and thus I quickly set off back down the alternative route to the road at Forest Hill. I then turned around and set off making my way through the pleasant gardens, photo 22, back towards the road Brenchley Gardens. 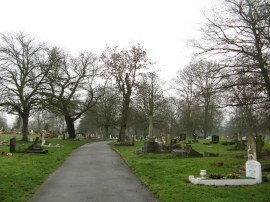 The route then continues down the road before heading to the right through the grounds of Camberwell New Cemetery, photo 23. 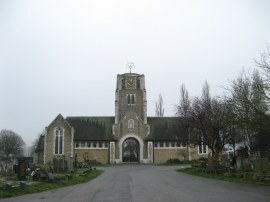 The route winds its way through the cemetery before joining a path that runs past the front of Honor Oak Crematorium, following the driveway through the gardens of remembrance. Leaving the crematorium the route heads to the left along Brockley Way, the road at first running along the edge of the cemetery. Continuing ahead the route crosses into Merttins Road and then over Ivydale Road into Inverton Road. Reaching the end of Inkerton Road the route heads to the right down Limesford Road. Here the route heads to the left through the South Gate into the grounds of Nunhead Cemetery, photo 25, however although the gate was open there was a big sign saying that the cemetery closed at 4:00pm and given that it was now 4:40pm I decided not to risk following the route through the large, and quite wooded cemetery just in case I ended up being locked in when I tried to get out at the other end in Linden Grove where this stage of the Green Chain Walk officially ends. 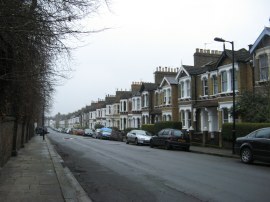 I therefore continued ahead along Limesford Road before heading to the left along Ivydale Road as I made my way over to Nunhead Station where I finished the walk. All in all I had walked 10.3 miles from Crystal Palace Park with my heading up and down the Dulwich Arm and the various walk alternatives. A direct walk along the route would be considerably shorter. However I made the station while it was just daylight, having walked just over 23 miles for the day in total which was a good distance for a February Day and meant that I had now completed every little twist and turn of the entire Green Chain Walk. This isn't a classic walk, although there are some very attractive stages, and it got me visiting areas of South London that I wouldn't normally see. 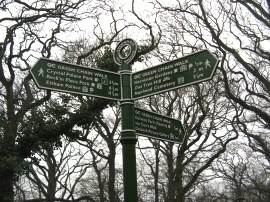 I have uploaded the route of the days walk, including stage 11, which can be accessed here Green Chain Walk Sections 9, 10 and 11 Route .